THE "GOOD SCHUFF," WHOM GAUGUIN HAD MET when they were both working for Bertin & Cie., stockbrokers, was his constant good Samaritan. Throughout his first years as a full-time painter (until 1891, when they quarreled) Schuffenecker, who had a small independent income, allowed Gauguin to stay in his house in Paris, and repeatedly came to his aid when he was short of money. This picture was painted in the studio in the Rue Boulard early in 1889, after his return from Aries and before he went once more to Brittany in the spring. With spread out composition, separation of figure groups, and broad areas of flat color, it is a bold painting in both concept and execution. It follows Gauguin's new tendencies, carrying out that "synthesis of form and color" of which he wrote from Aries. Insofar as this is true, it is an "abstract," conceptual painting. At the same time it has psychological penetration rare in an artist who generally preferred the creatures of his imagination. 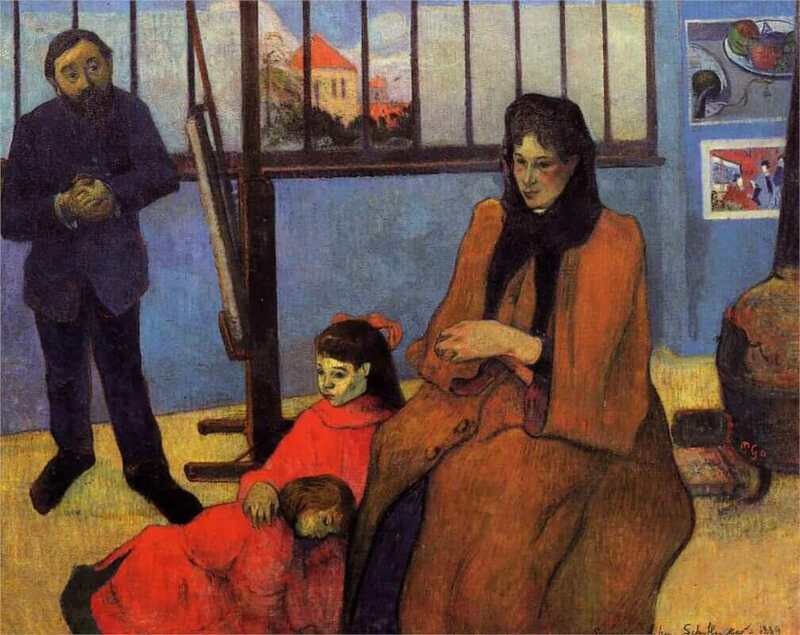 The placing of Schuffenecker, shy and retiring, to one side, his almost apologetic pose, suggest at once his relation to his family and to Gauguin himself. In the blue wall behind the corner the angle is hardly noticeable, so that the whole surface acts like a single backdrop to set off the figures, especially the pyramidal foreground group. The contour of this group, particularly the unbroken outline of the two children, suggests the rhythm of some of the Aries paintings of both Gauguin and Van Gogh done in the immediately preceding months. But the pose of the sleepy child is reminiscent of Gustave Courbet. If the Japanese print on the wall suggests a source for the employment of areas of flat, bold color, the whole psychology of the painting recalls Degas' early portraits and their melancholy world of closely associated people who yet exist in utter detachment. The anxiousness of the modest painter only heightens this mood.